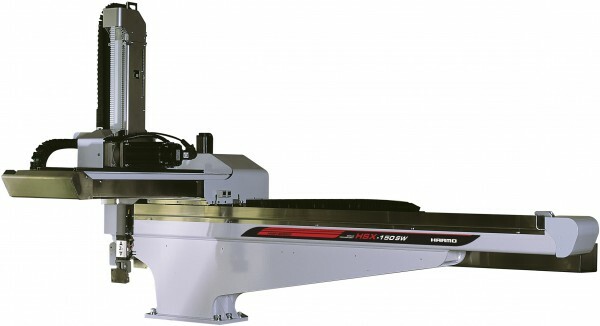 New design & high speed with precise take-outs! The equipped centralized lubrication system can stablize the high-performance, low noise, and long-lifed guides. The system drastically reduces the hassle of lubrication during the periodical maintenance. ●The robot has the centralized exhaust, the grease catcher, and the stainless cover for the clean room use. HSX robots are ready for the clean room use to accommodate the high demand of the high speed robot in the clean rooms. This series is optimum to keep the cleaness of the factory. The equipped PISCO cable tracks are low on wear, noise, and dust. ●Memory for 50 mold data with group management. ●Color LCD of 5.7 inch with excellent visibility. 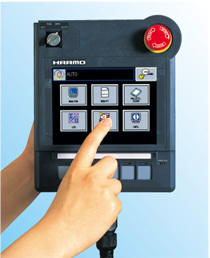 ●Larger, light-touch 3-position safety switch.